We’re less than two weeks away from Christmas and I still haven’t seen a flake of snow in this town… but at least our home is festive. We had an ugly sweater party last year but this year we’re not hosting any Christmas shindigs. Since no one will be witnessing our decorations I decided I will just share some pictures here! Love my art from AmberThomasMakes ! Love it! 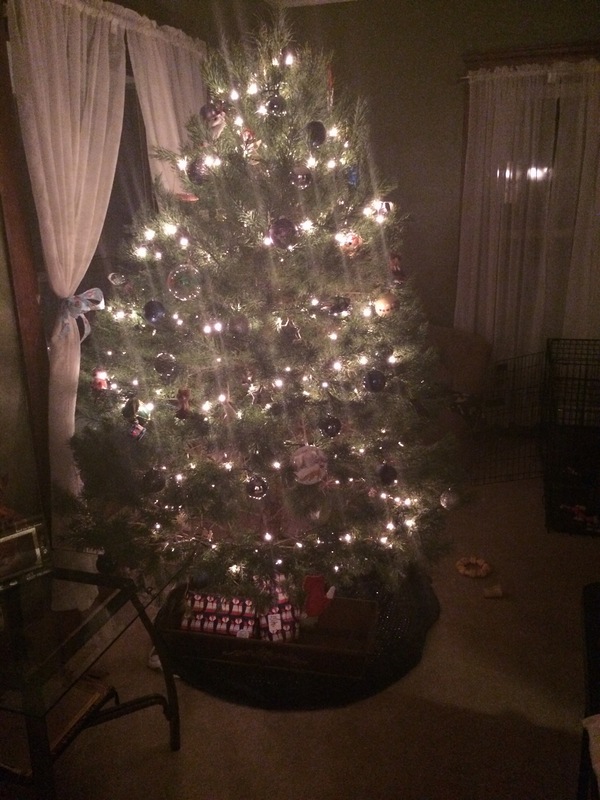 I failed on decorations this year… My tree still isn’t done! 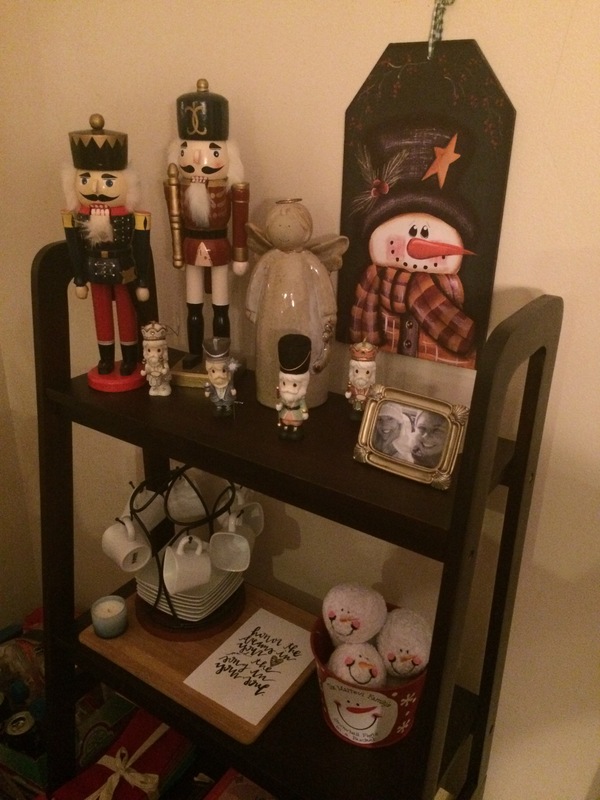 Love your nutcracker collection! There are some bare spots around the house that I had high hopes for… but I’ll just tackle them next year 🙂 The nutcracker collection was/is unintentional- I just have so many! Haha! Thanks Rebecca! I found it after the holidays last year for super cheap! It was just what the front porch needed. It drives me crazy how bare our porch is… hopefully we can get some chairs out there this summer! That fox stocking is so cute! 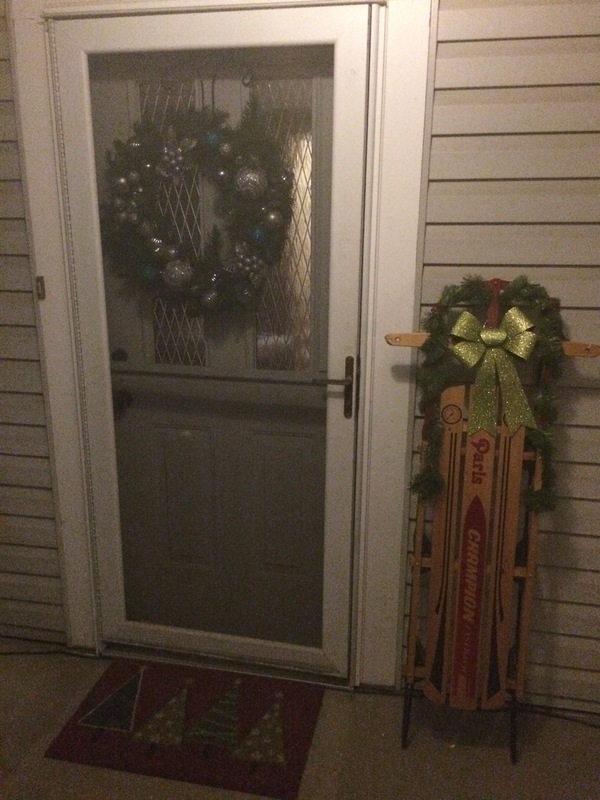 And I love the sled by the door! Thank you!! (I found it at a Cracker Barrel) That’s Enzo’s stocking! He didn’t get one his first year since he was adopted so close to Xmas, but when I saw it I knew I had to have it and he was the last one to need a stocking! Looks so cozy and inviting. You should link it up at Our Pretty Little Girls home decor link up today/this week. Going on till Christmas. People love to look into other’s homes. Here is the link: http://www.ourprettylittlegirls.com. Visiting from ember grey’s grateful heart. Oooh, thanks for the link-up suggestion, Michelle!! I linked-up and threw the link in the post 🙂 Thanks for stopping by!! Your house is super cute, as are all of your decorations! Umm are you obsessed with foxes too?! I spied a bunch in your pictures and I want allll of them! 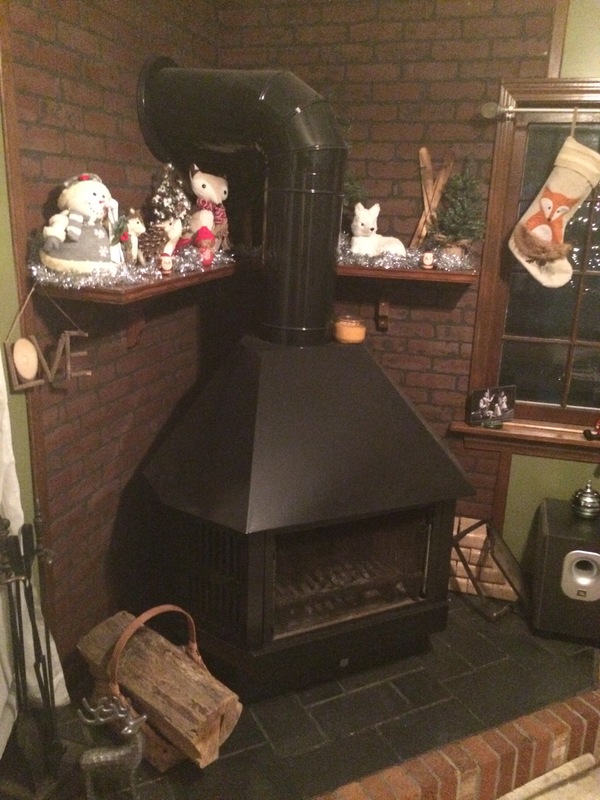 I’m kind of obsessed with your wood stove. I want a wood stove. I love how festive your house is! that fox wine sweater is amazing! in fact, all of the foxes you have are amazing. 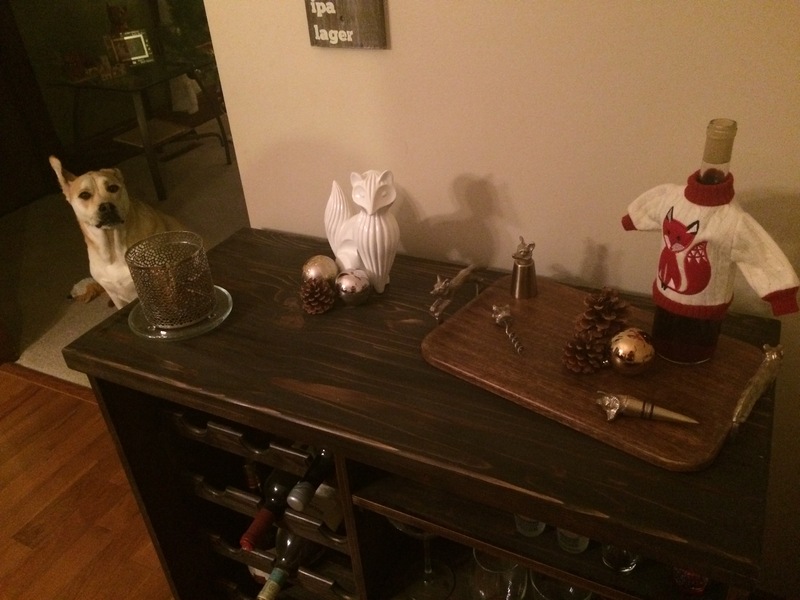 thanks for sharing, I love peeking into people’s homes around the holidays (okay, all the time!). We might have a fox problem in our home… 😀 I actually have THREE of those wine sweaters (all gifted to me). I only have one on a bottle, but one is on the tree and one is in storage. I love looking at other homes, too! My mom and I actually did a Christmas heritage home tour last Sunday and visited 10 homes! Haha! So cute! Love all the stuff on your mantel. I guess you call that a mantel around your furnace? I definitely call it a mantel! 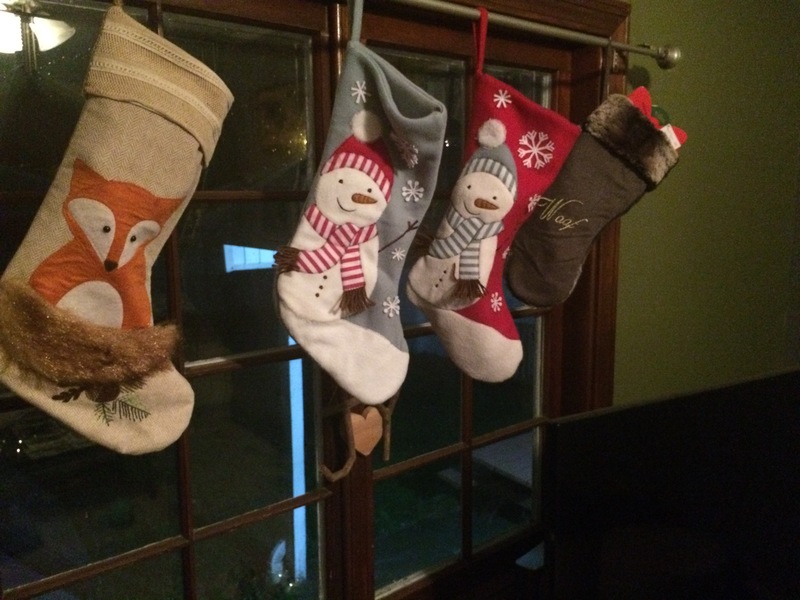 It’s a little awkward when trying to hang stockings but this year I got creative with the unused curtain rod! My winter wonderland scape on the ledge is my favorite thing to put up! And thank you! So pretty!! I love how sweet your dog is sitting for the picture 😉 Your home is beautiful, that fox stocking is the best! your home is so so festive! 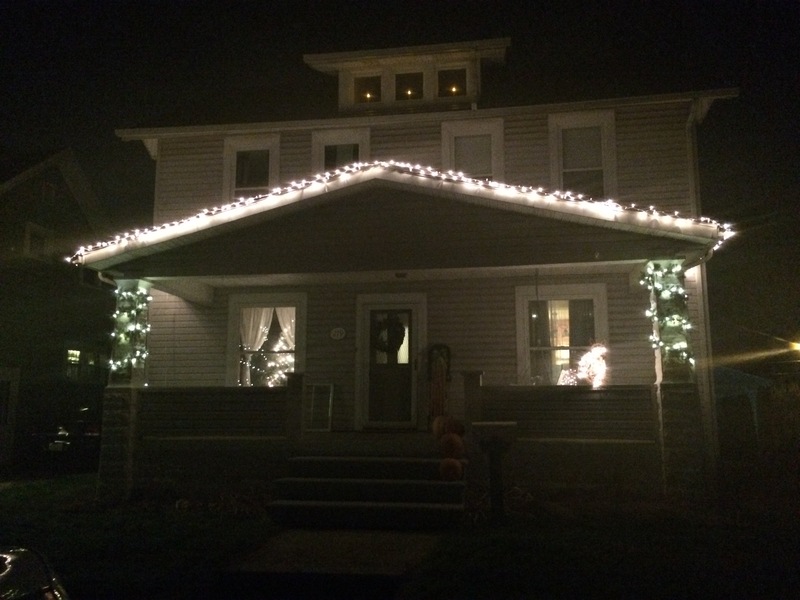 white lights on houses are my very favorite!!! glad you are getting in season and now fingers crossed for snow!